Discover the difference our premium countertops make in your kitchen or bathroom, as well as your budget. As an owner-operated company, we are committed to making our clients' needs a priority. Property owners turn to our team when they need new countertops in Feasterville, PA, and in the surrounding areas. From sophisticated granite products to stylish quartz, we deliver and install the area's most trusted countertops. Countertops are essential components of any home, and they make it easy to refresh your kitchen or bathroom without renovating the entire area. Some countertops provide eye-catching appeal that grab attention, while others quietly complement your kitchen or bath’s decor. No matter your preferences, you can rely on our contractors to connect you with the right products. 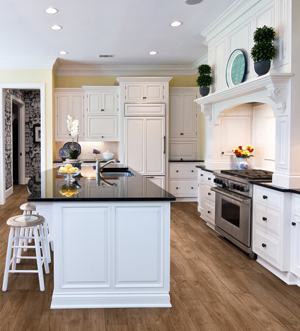 Are you looking for a particular countertop pattern, color, or thickness? Consult with our showroom team to learn more about our selection of materials, and we’ll show you products that match your needs. With help from our contractors, it's easy to secure the kitchen and bathroom countertops you want at prices you'll love. We have an impressive selection at our showroom – from granite and marble to quartz and Solistone countertops. Granite Countertops – Let our contractors install countertops made to last. Granite countertops are the products of choice for many property owners. You do not have time to worry about accidents associated with children, pets, and messy cooking projects. Instead of concerning yourself with damaging your countertop, consider installing granite. These countertops are easy to clean and resist bacteria, heat damage, and scratches. With granite in your kitchen, it is easy to go about your daily routine. Quartz Countertops – Are you looking to make an investment in your home's appearance? You should consider purchasing quartz countertops for your kitchen. Many local homeowners reach out to our contractors to purchase durable, affordable, and one-of-a-kind countertops. These beautiful products are available in many natural hues and resist damage caused by pots, pans, and other kitchen tools. Best of all, they add appeal to any room and value to your home. Be sure to recruit our team for installation services, as well. Many countertops consist of materials that, while durable, are also quite heavy. Do not attempt to lift and place your new countertops without help from experienced professionals. Instead, let our team install it for you. We bring decades of experience to each countertop installation project we undertake, making us trustworthy choices. Contact us or visit our shop to find out more about our countertops. We proudly serve families in Feasterville, PA, and the surrounding areas.